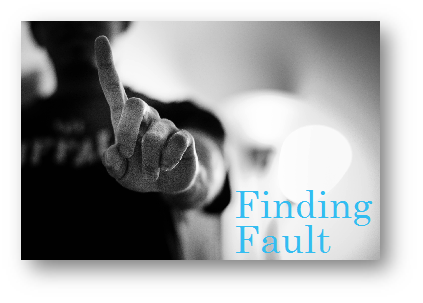 This article focuses on a topic to which everyone can relate: criticism of and finding fault with others. It is a tendency that all humans have, and it is easy to fall into. We are not referring to constructive criticism, which lovingly strives to help another, or where principals are violated and correction is necessary. Rather, we're looking at the tendency to call attention to others' faults. From the many Scriptural admonitions along this line, we can see we are not alone. Few have been immune – if any. 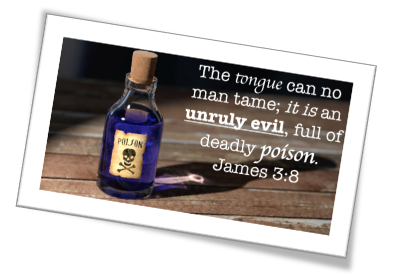 As the Apostle James puts it in James 3:8, "The tongue can no man tame; it is an unruly evil, full of dead ly poison." The outcome of this tendency (if not controlled) can lead to an extreme judgmental attitude that causes strife and division. Why is it that we find it so easy at times to see the imperfections of one another, rather than the lovely qualities that each one has? Because we are sinful and human! 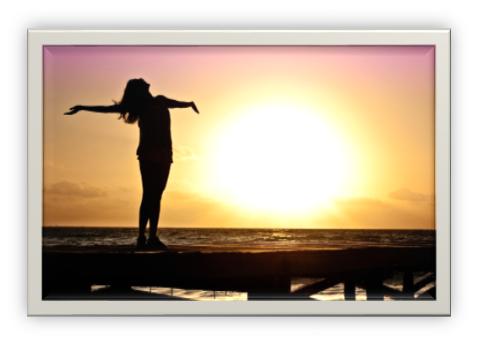 What are some of the underlying reasons WHY it is so easy – almost natural – to indulge in criticism and faultfinding? The first reason is that as Christians who study the Bible, we can understand perfection and the difference between right and wrong. If you study God's word, you are aware of the principals that govern God's universe. We have the example of the perfect life of Jesus to emulate. We are so ingrained with the principles of right and wrong, that it can be very easy to spot the tiniest speck of imperfection in those about us. Understanding what is the ideal, we expect to find it demonstrated in all our brethren all the time. 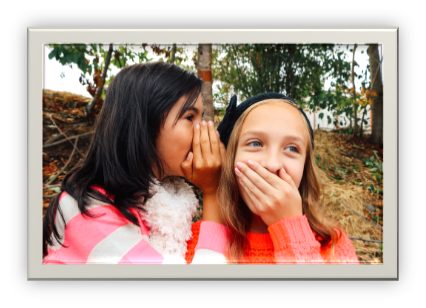 This brings us to the next reason WHY criticism is easy – RATIONALIZATION. Rationalization is a very subtle aspect of our sinful nature, which continually strives to justify. That is to find any good, plausible reason for absolutely everything we do. It is the Church that is especially instructed to speak evil of no man. Of course, it is natural for our fallen flesh to "dodge" nearly everything, and to try to think out some way by which we could justify ourselves in saying something unfavorable of another; and it seems that even the Lord's people have often "edged around" to see what excuse they could find for speaking evil and yet not feel condemned. One of the reasons we tend to try to justify ourselves is that it subconsciously boosts our ego and helps us to eliminate guilt feelings in ourselves. Many times, we realize we have so many shortcomings in the fulfilling of our vow to live as Jesus did. We want so desperately to do better, yet we fail time and time again. Feelings of guilt begin to come over us. Our natural human flesh doesn't like feelings of guilt! It wants to make us feel we are doing great at all times. One way our flesh tries to convince us that we really are doing VERY WELL is by comparing ourselves with the faults of others! So our fleshly subconscious mind is continually on the lookout for the failings and shortcomings of others. When one arises…oh how quick the flesh jumps at the opportunity to call it to the New Creature's attention. It taps the New Creature on the shoulder – "Look! Did you see what that person did? Isn't it unbecoming?! They should know better, etc., etc. We're better – we don't have that problem!" Of course this type of conversation doesn't literally, consciously take place, but its reasoning does subtly register in our subconscious. Sometimes this comparison of our faults with the faults of others stays in our thoughts, but we often voice it openly to others, who, unfortunately, will often concur. Now we have another individual agreeing with us saying, "Yes, that was a terrible thing to do." We then walk away contented with the victory of having proved our point. We subconsciously say to ourselves: I'm really doing very well compared to these others with their various faults. But, how subtle and deceptive this subconscious reasoning could be. Though we may not have the faults of others, we may have some that are far more severe. 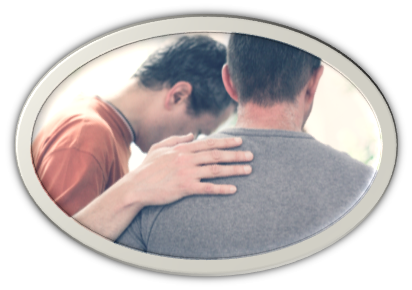 Emphasizing this lesson, our Lord suggests that those who are always finding fault with the "brethren" who, like themselves, are trying t o walk in the narrow way—who can never see the noble efforts of the "brethren" to copy Jesus, but instead are continually picking at them, are the very ones who have the greatest of faults in themselves: LOVELESSNESS. Jesus reproves us in Matthew 7:3, saying, "Why do you stare so at your fellow who is troubled with a grain of sawdust in his eye, while you have a whole rafter in your own eye?" All of us are more or less troubled with difficulties or weaknesses of one kind or another, because within our earthen vessels, marred by sin, we all possess the treasure of the desire to be like Christ. In finding fault with others, we are evidently wishing to imply that we are not afflicted with these same weaknesses. We want to give the impression that we are holy, and since we know in our own hearts that this is untrue and that we have many failings and imperfections, we are being hypocritical, deceptive and displeasing to God. To claim that fault finding is prompted by love for the erring and a hatred of sin is deceptive and hypocritical, as our Lord's words clearly show (Matthew 7:3). Otherwise, we would find plenty to hate, condemn and battle against in regards to our own sins and weaknesses. Let's look at the worst aspect of fault-finding: the MANNER in which it's often done, which can be rather sharp. However, if it were done in a kind, gentle, loving manner, would it be proper? It is a great mistake to suppose that because the evil thing is said in a kind and gentle manner, that it is a good thing, and evidence of a pure heart which is full of love. We know that Satan is continually presenting himself in garments of light that he may exercise influence for evil upon those who have made a covenant with the Lord. Those who implant evil thoughts, etc., in a smooth and polished manner, even with a tear, are the most dangerous enemies of peace and fellowship, and often accomplish great harm. 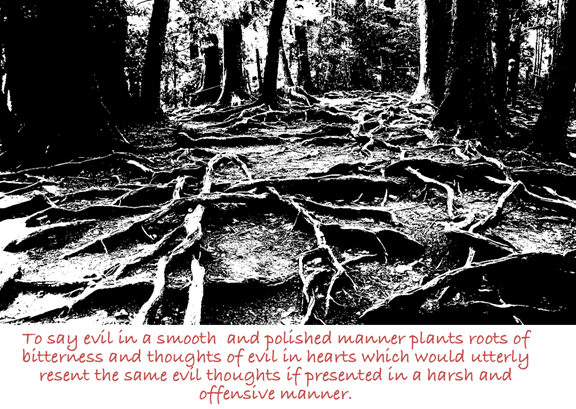 They plant roots of bitterness and thoughts of evil in hearts which would utterly resent the same evil thoughts and evil surmisings if presented in a harsh and offensive manner. Another way in which our flesh rationalizes and justifies fault-finding is by thinking, "You know in a general way the Scriptural principal of 'speak evil of no man' is good, and we should follow it in general. But you have to remember there are EXCEPTIONS! Aren't we all supposed to be WATCHMEN?! Isn't it the duty of a watchman to look out for his brethren's interest? To warn others of those going astray, that they be not injured." Yes, there may occasions that are few and far between that this may be necessary – but may it only be used as a last resort and pain us terribly to do it. May our primary concern be how we can help one another in our struggles to overcome. If we come upon one of our brethren who has slipped and stumbled in their walk, may we crush any impulse of calling others' attention to it by remembering Proverbs 11:13, "A talebearer revealeth secrets: but he that is of a faithful spirit concealeth the matter." So may we conceal rather than reveal. May we go to the one involved with a desire to help, to uplift, to encourage the heart that is repentant – a heart which in most cases will be sad, remorseful and heavy because of their failing. The Scriptures outline for us the proper procedure to follow when we have been "wronged" personally. That is not to utter one word of criticism to another soul, but to go to the person we feel has wronged us. A true Christian will cultivate the disposition to think charitably of the words and actions of others, and to suppose that their intentions are good, until he has positive evidence to the contrary. Even then he will go to the person alone. One of the hardest lessons for Christians to learn thoroughly is Jesus' command to go to the person alone if they have anything unpleasant to say about another (Matthew 18:15-17). 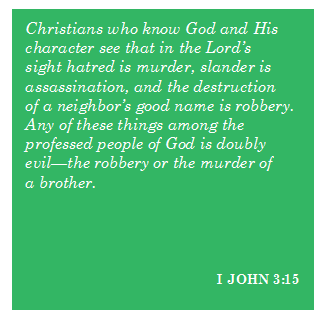 Christians who know God and His character see that in the Lord's sight hatred is murder, slander is assassination, and the destruction of a neighbor's good name is robbery. Any of these things among the professed people of God is doubly evil—the robbery or the murder of a brother (1 John 3:15). Look again at Matthew 18. We are to apply this principle ONLY when the wrong has been done against us personally, NOT against someone else. We are to examine our own actions and practice this on ourselves. Focus on your own family and let others look after their own. Another reason why we are so prone to criticize is PRIDE. The spirit of pride finds fault with everything and anything it encounters. This is another attitude we have to be on guard against. Our flesh may suggest, "You know, your viewpoint of almost all matters is really superior to the others," and "Don't hold back – speak out – let them know where they are wrong." But when it comes to following God's principles, there is neither Jew nor Greek, bond servant nor free, male nor female – for we are all ONE IN CHRIST (Galatians 3:28). We are all EQUAL – no one is subservient to another except to the Lord. We are FREE to think, act, and believe as we choose. No one is over us – or a superior to us – telling us what we must do. Therefore, in reality, our view could be superior to all others. Our liberty gives us freedom of thought and action. But how careful we must be to use that liberty lovingly. Not to give the impression that because of our freedom all others should bow and acquiesce to our wishes, our thinking, our preferences. 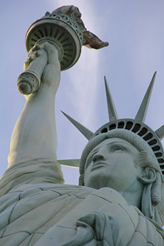 We all want liberty—to think, act and believe as we desire. But it can be difficult to grant this same liberty to others – to let them choose their own way. If we want liberty for ourselves, may we in turn extend it to others. We must NOT INSIST on things always being done our way, but bow to the wishes of others. Sometimes we can be so zealous in our desire to uphold that which we believe is Truth – or the proper procedure, or whatever the issue is, that we can easily forget the spirit we are manifesting and forget the scriptural admonition of Titus 3:2—To speak evil of no man. This brings us to the next reason WHY it is so easy to sometimes justify fault-finding – which is PEER PRESSURE. All of us like to think we are our own person; that is, we base all of our actions, decisions and beliefs upon our own understanding of the Lord's word through His guidance by the Holy Spirit. But we are also influenced to a degree by peer pressure. That is, we are influenced by our friends or those we admire. Whether we are conscious of it or not, they do influence our actions, decisions and beliefs. We are concerned with what others will think. But we must be careful never to do anything merely to be well thought of by others – especially in the area of fault-finding. Once fault-finding is initiated, it seems to spread very quickly – like wild fire. One momentary slip of our tongue could destroy the reputation of another. The Apostle Paul gave sound advice to brethren who were criticizing one another over food in Romans 14:13, 19-20 (NASB), "Let us therefore stop turning critical eyes on one another. If we must be critical, let us be critical of our own conduct and see that we do nothing to make a brother stumble or fall…let us pursue the things which make for peace and the building up of one another. Do not tear down the work of God for the sake of food." In other words—do not tear down the work of God for anything that, in the light of eternity, will be found to be insignificant. How much more becoming and how much more profitable it will be for our spiritual welfare to look for and call attention to the lovely qualities of others. 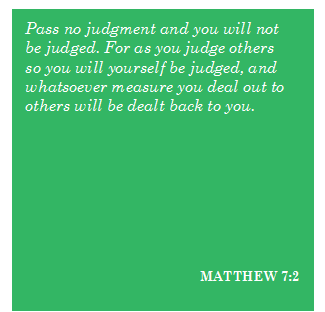 May we ever bear in mind the principal of Matthew 7:2, "Pass no judgment and you will not be judged. For as you judge others so you will yourself be judged, and whatsoever measure you deal out to others will be dealt back to you." James 2:12,13, "Always speak and act as men who are to be judged under a law of freedom. In that judgment there will be no mercy for the man who has shown no mercy." If on occasion someone steps on our toe, may we be quick to forgive when we see the first impulse of repentance. Try this as an experiment: for the rest of this day, concentrate with determination NOT to complain or find fault with ANYTHING! Not with the air conditioning, not with the food, not with things of the world, not with others, not with our spouses, not with the driver in front of us, not with anything! When we find our thoughts beginning a criticism, strive to crush it out, ignore it, change the subject before it reaches the lips. Force your mind to think instead of things that are pure, lovely, honest, virtuous, praiseworthy– all the blessings we have to be thankful for! May we all strive harder. If we can be successful for a day, we can be for a week, a month, and finally a lifetime.